Nutrients are typically split into two types: Part A and Part B. This is because you want different amounts of certain nutrients for different times within the plant’s life cycle. Products marketed as “grow” solutions are high in Nitrogen (N), which make it excellent for your plant’s vegetative growth. Products marketed as “Bloom” are high in Phosphorus (P), which help with flower development. You need to be very careful when mixing up your hydroponic nutrients, as too much will cause plant damage and/or death! So start with lower amounts when starting out and slowly up your dosage to full strength. So how much should I use? That really depends! Certain strains can handle more nutrients than others, and certain nutrient manufactures have different guidelines. So, be sure to check out the label of your nutrients, and go to the producer’s website to learn more. 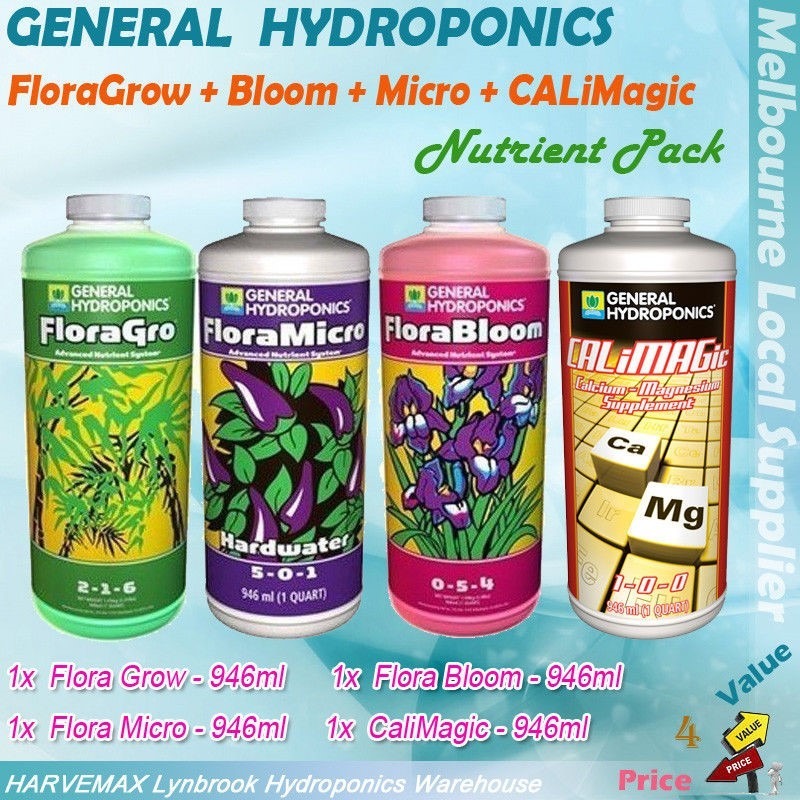 In this article, we are going to take a look at the General Hydroponics Flora range. As we’ve had personal experience with it – with stunning results – this is what we recommend. More seasoned growers will typically hunt out more interesting and exotic nutrients, or go for an all organic solution! Because we did a hand watering grow, we employed a “Drain to Waste” nutrient solution. This means that when you water your plants, you are allowing for 5-25% water runoff after each water. Then, after each feeding, you’re going to be watering with just plain adjusted PH (5.5 – 6.5) water. When adding your nutrients to your water mix, it’s import to add them all individually to the watering can or bucket, as mixing them can cause some minerals to become unavailable to the plant. So start with FloraMicro in a cup of liquid, then mix it into the watering can. Then go ahead and do the same with FloraGro and/or FloraBloom, then finally the CaliMagic. 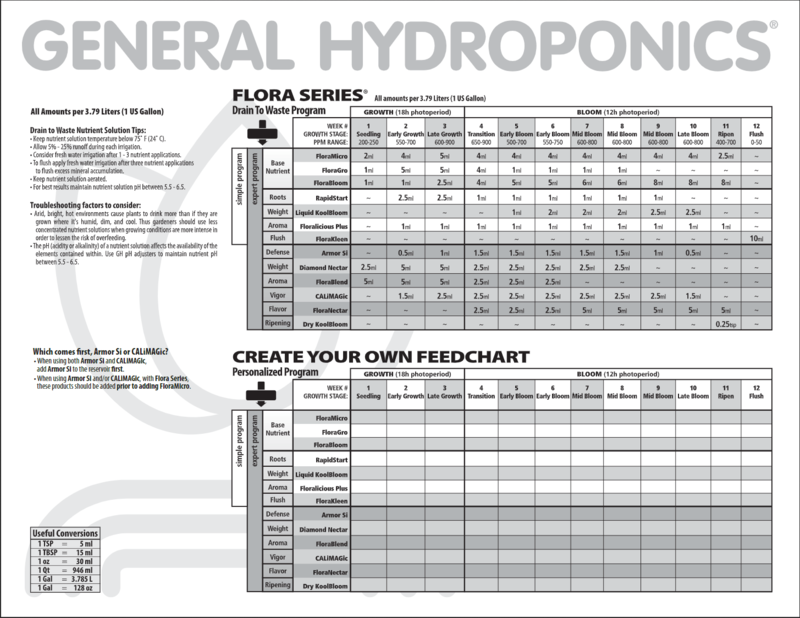 Click the image below to view General Hydroponics Drain to Waste feeding chart. You can also find out more information on the General Hydroponics FAQ page. Remember from that chart, the watering can/bucket is measured as a gallon – or 3.79 Litres. The feeding amounts are measured in millilitres. To achieve accuracy, use a syringe. You’ll be able to grab a couple from your local chemist with no issue. This is a guide only. Individual breeders may have other recommendations for feeding schedules… so, be sure to research the seeds you buy! Auto-flowering seeds, for example, swap to flowering later in life, and need fewer nutrients throughout their whole life cycle. So, What About Organic Nutrients? If you’re asking about organic nutrients, you probably want the tastiest, best smelling buds around! Organic nutrients are ideal for the best buds, but require a little more work to adjust and use. They’re utilised in hydroponic setups where there is no static reservoir, using the “Drain to Waste” method. Organic nutrients have the potential ruin your water with bacteria and other icky things. Chemical nutrients are known to help make cannabis grow quicker. Many people wonder if organic nutrients are actually better for their cannabis… and they certainly do have their benefits. Some people believe they get more fragrant buds from using organic nutrients. It’s natural, which could be important if you’re growing in an artificial environment inside your home. But make sure you don’t use organic nutrients for a regular hydroponic setup. Organic nutrients can spoil the water in your reservoir with bacteria or overgrowth of organisms. Chemical nutrients increase the potency of your buds, and are generally the way to go for a hydroponic setup. It’s possible to buy organic nutrients from the United States. 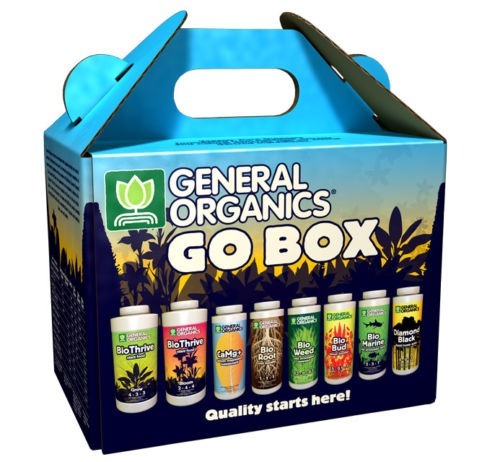 It works out to around $200 for “General Organics Go Box”, which is quite expensive! These are about half the size of the general hydroponics bottles. If you’re after organic nutrients, though, this may be your best and easiest bet. Another great option would be buying some incredible organic soil. 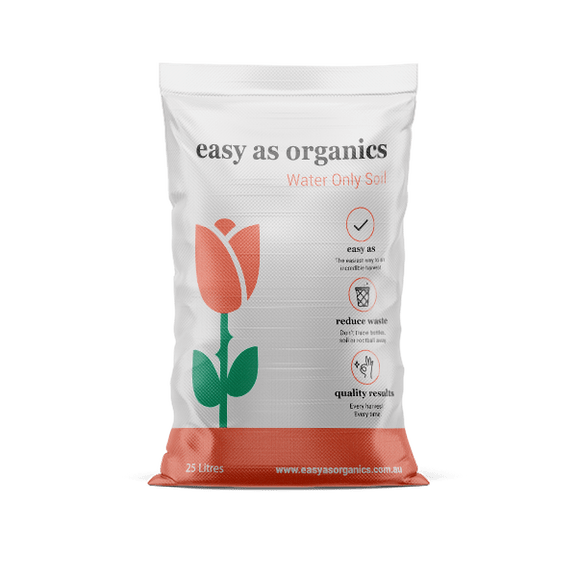 Check out Easy As Organics! for this purpose. They offer a rich soil which you only need to water; meaning, there are no nutrients required throughout its growing cycle. We’ll have a more in-depth article regarding using living organic soil soon! 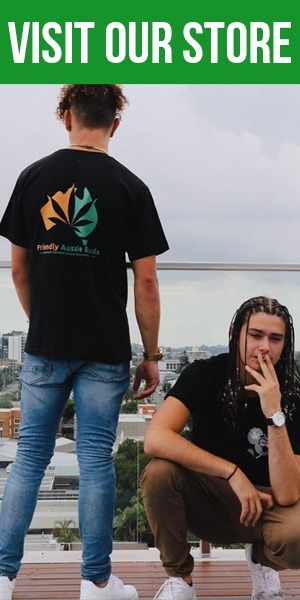 Use the code FABEAO2019 for 20% discount on all their Water Only Soil. 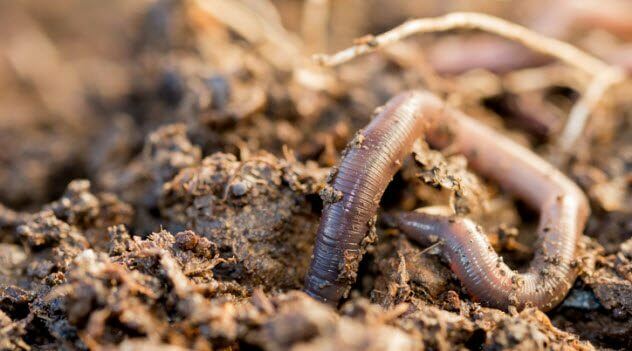 Another option would be to look for some organic worm juice. You can find this around locally on gumtree and/or the Facebook marketplace, as well as some online stores. We’ve stumbled upon Craig Campbell’s Worm Juice on Facebook, and have found it to be excellent. He is quite helpful to chat to; he’ll mail it right out to you, if you ask him. In regards to using nutrients in soil, you’ll need to check what soil you are using and whether it contains nutrients. If it’s “super soil”, which is basically soil with compost mixed through it, then you may not need anything additional. Growing in soil is generally a lot easier. Just as if outside in the garden – the plants will just grow. Albeit, they grow a bit slower, but they’ll do it without as much help. The most important thing with soil is knowing how to correctly administer water. It’s also possible to add hydroponic nutrients to the soil… but use a very low dose, to begin with! This is not recommended to beginners, as you could ruin your plants by doing this. Our recommendation is to use hydroponic nutrients and coco coir/perlite for your soil. This just makes for an overall easier process for you as a beginner grower. However, after a while, you may want to start experimenting with other soils, and seeing what you prefer! 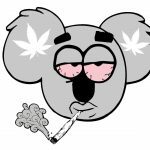 This sheer versatility in options is part of why growing cannabis may come to be the next great Australian pastime!